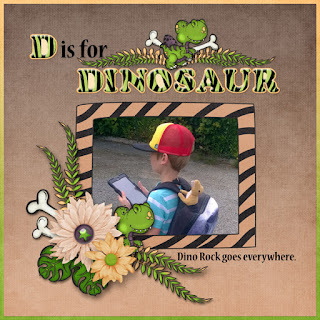 Welcome to another Digital Scrapbooking entry! There are TWO, today and tomorrow and all four are full of freebies. So don't miss any of them. There is just so much going on. One blog is not going to do the trick. Let's see what some of the other designers have out there for this weekend and what I've done with it. Most of the celebration will be starting tomorrow. That IS the day, after all. Hehehe...Some of us just can't help ourselves. 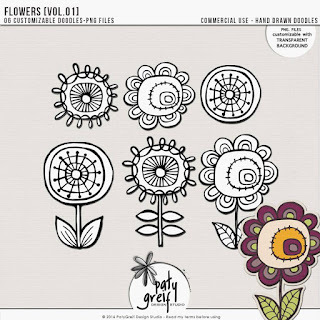 My gal Paty Greif, has some great sales and freebies, including free Commercial Use. Read more and get the links. 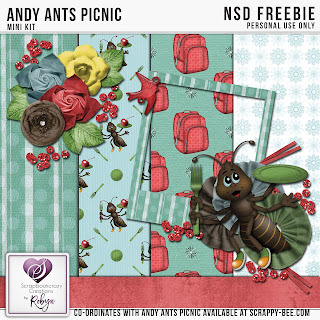 This lovely kit is free when you purchase anything $5 or over from Paty's store at Pickleberrypop. Here is my layout. I used a free template from Lissy Kay Designs. 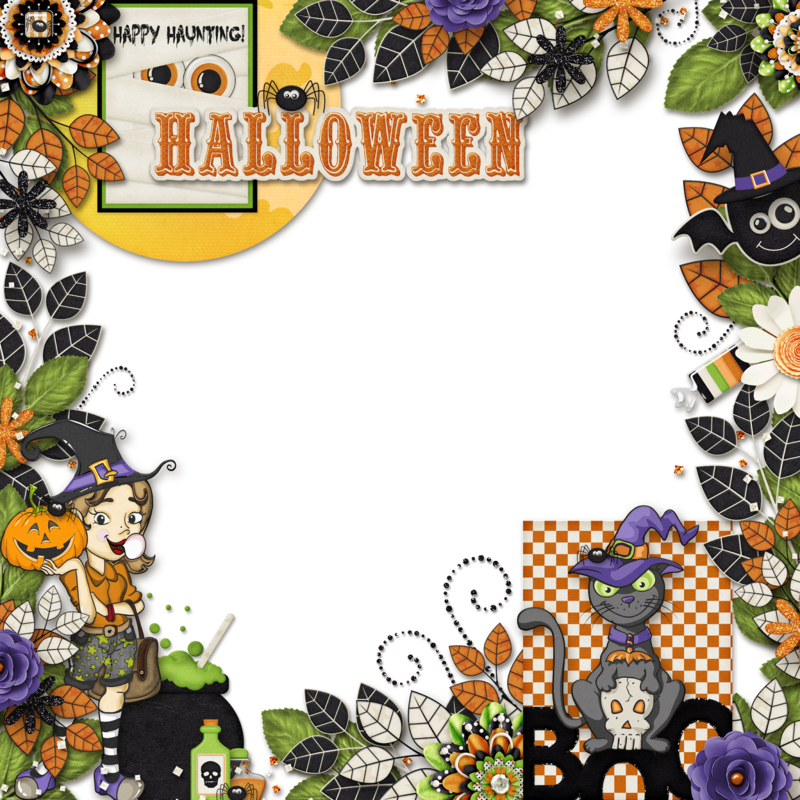 She's got free templates all week and if you are just hearing about this, then you better get over to the forum and get what you still can. 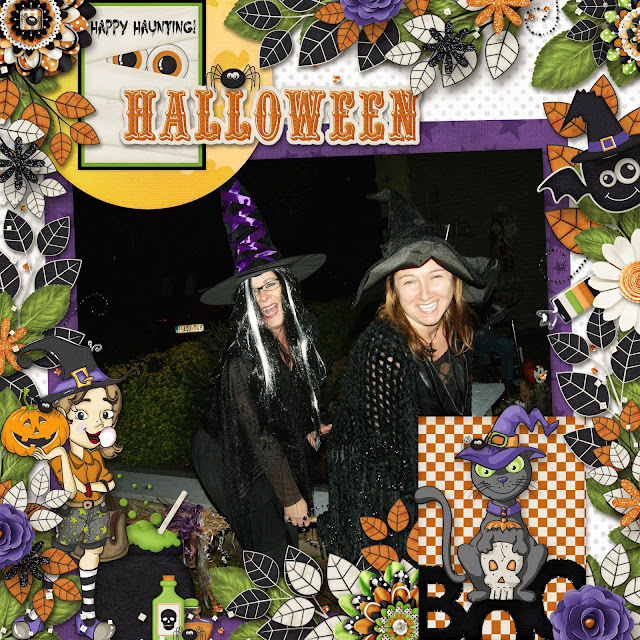 This is free commercial use from Paty that you will find on Saturday, October 1st in the Sugarhillco hop. Here is the link for the blog where you'll be able to start the hop, tomorrow. This image is linked up to Paty's Commercial Shop. Do a bit of window shopping if you please. Here's a look at the three bundles that are more than 70% off this weekend. You won't find prices like these until next year. So grab them while they are hot. Paty must really love autumn. She's put her passion for the cooler days in this absolutely gorgeous collection, Autumn's In The Air. It must have caught on to me, because I could not stop scrapping. See what I designed with it. 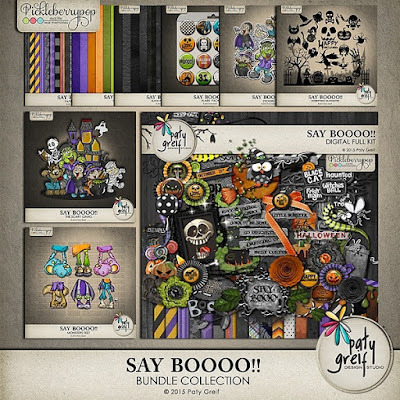 Ya don't have to love Halloween to love this bundle collection, Bootiful Witch. It's also on a 40% off promotion. Here's my lovely layout turned into your magnificent freebie. I'It is for Personal Use ONLY. Go to Paty's blog and get the link there on this same image. Enjoy! 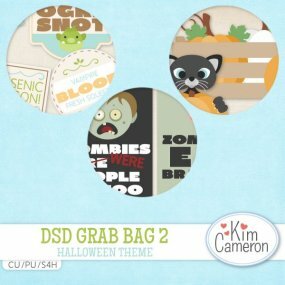 Kim Cameron is also having some super deals this DSD. She's designed several templates and has them on a super promotion AND if you look hard enough, you'll find a free one, too. 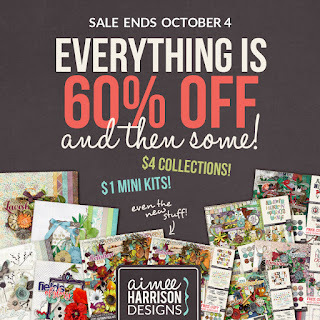 Most of the shop is 60% off, but the grab bags are up to even 80%! I finally scrapped this precious picture of my oldest and our now, passed kitty. He was such a cutie and died way too young. Dream on little kitty. 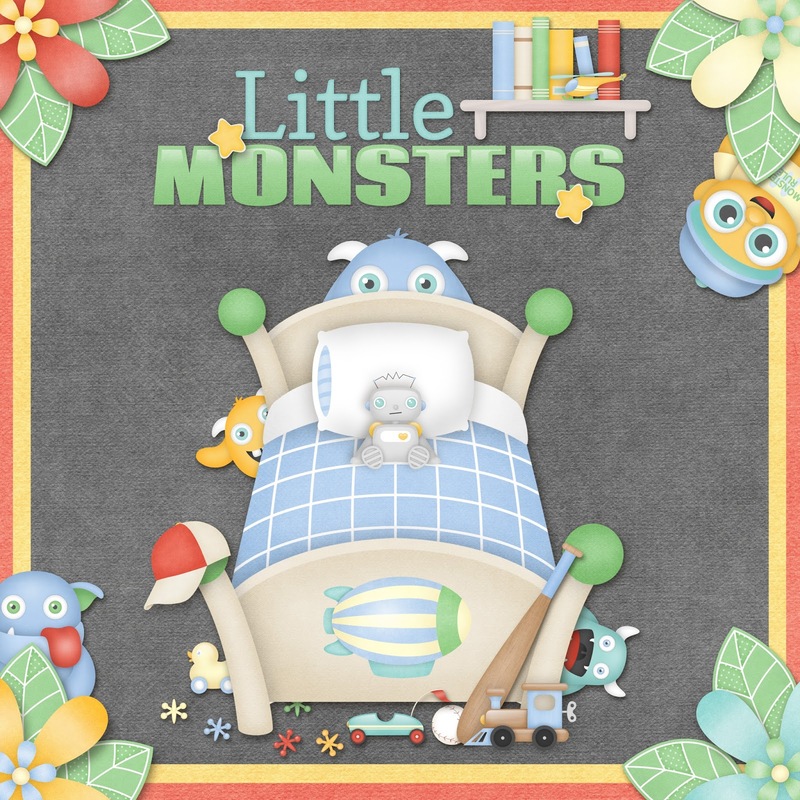 This kit is also from Kim and it is Closet Monster. It's an older kit, but a keeper. Check out a similar kit, Little Monsters. I featured it also on our blog, here. You may find a freebie there, too. Take Me To Your Leader is so much fun! 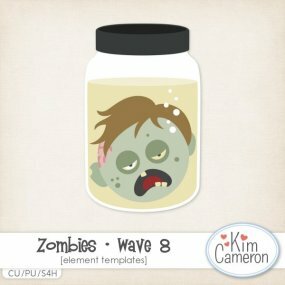 I teamed it up with another great template you can finding Kim's shop, today. Here's a look at one of the many grab you can get. 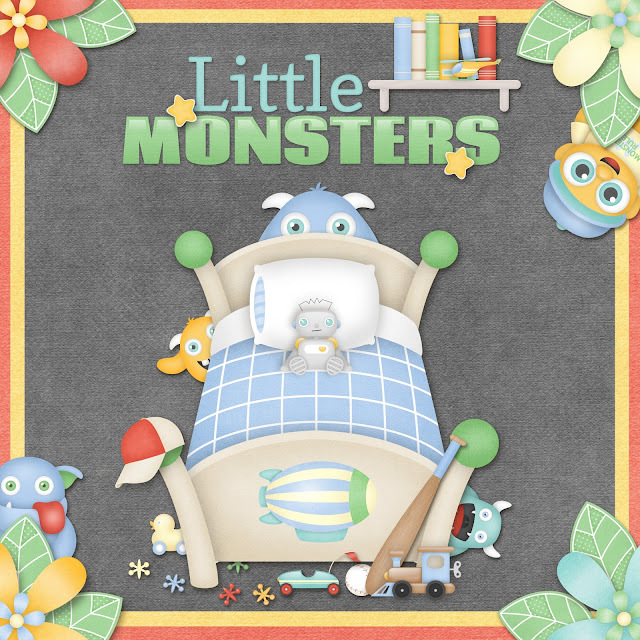 You'll also find this free Commercial Use in her shop. Thanks so much for joining us this DSD! Get ready for some serious freebies coming your way. 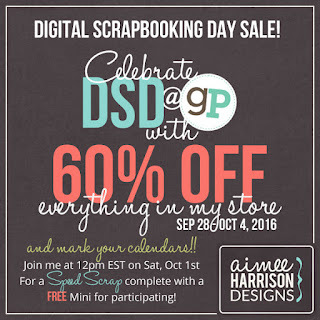 Digital Scrapbooking Day officially starts tomorrow, but there are aloof awesome deals and megs freebies already out there in celebration. 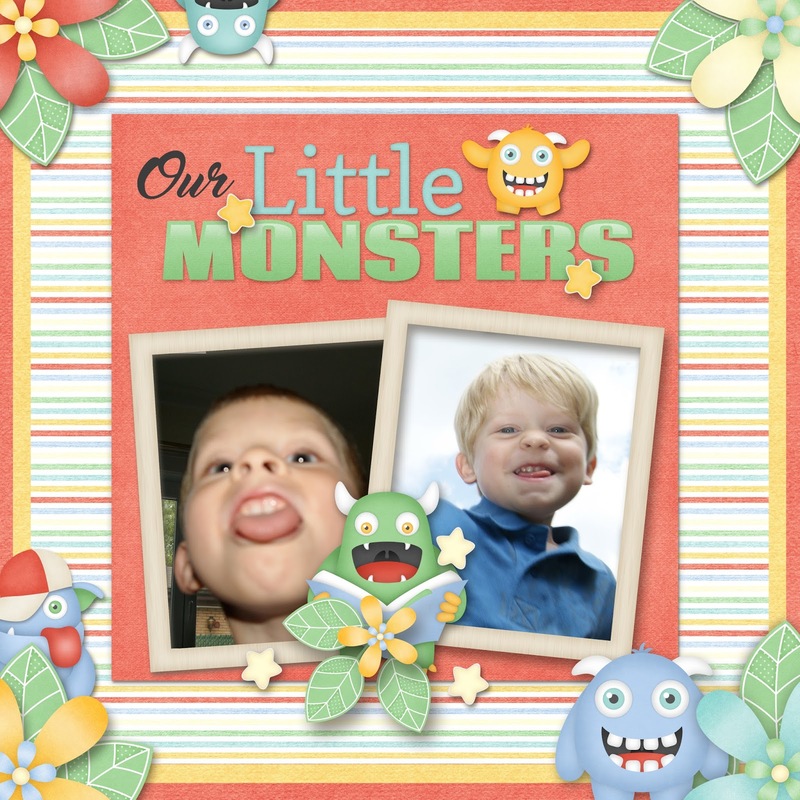 Perhaps you're not a digital scrapbooker, but you're curious? 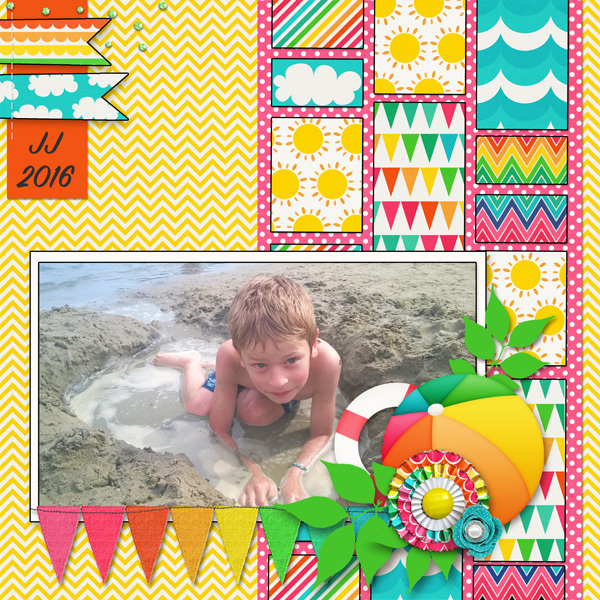 We've got a fantastic blog dedicated on getting you started digitally scrapbooking and designing FOR FREE. To see that blog, click here. 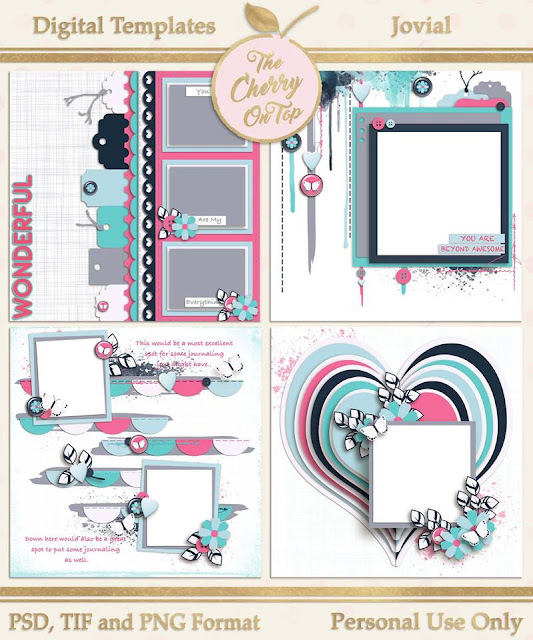 At The Cherry, we love digital and traditional scrap. However, today is dedicated to digi side. Read on to see up coming freebies as well as ones already live. There is no way for us to show you all that's out there on this blog. So, we started our annual, DSD Pinterest Board where you can find hundreds of offers, sales, freebies, giveaways...You won't want to miss out! 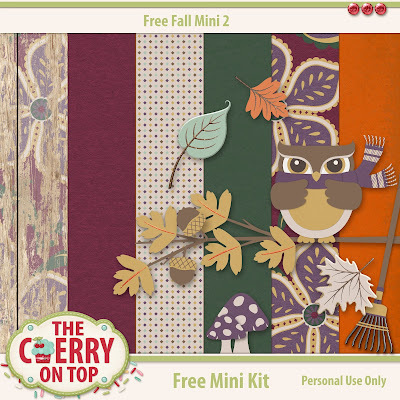 This free mini coordinates with last year's free, fall mini. Put the two together and you'll have a nifty kit. It will be available on Sunday's blog. 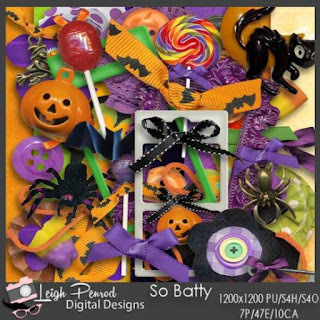 This template will be up for grabs tomorrow along with a list of other stops where you can find fantastic freebies in Leigh Penrod and Friend's Blog Hop. This template will also be available on another blog, Saturday. 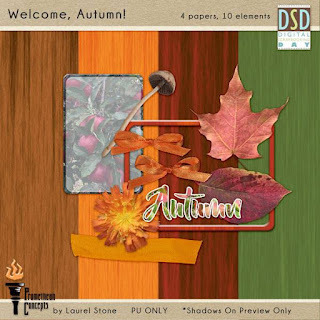 It's our DSD treat for you. 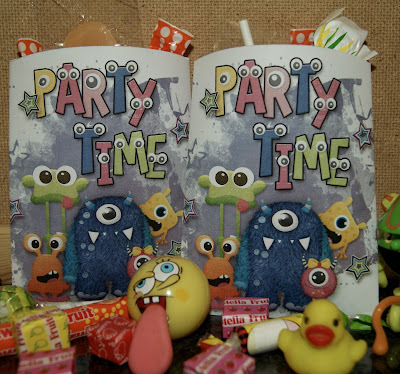 These monstrously cute treat bags were last week's hybrid goodie. You can still download. 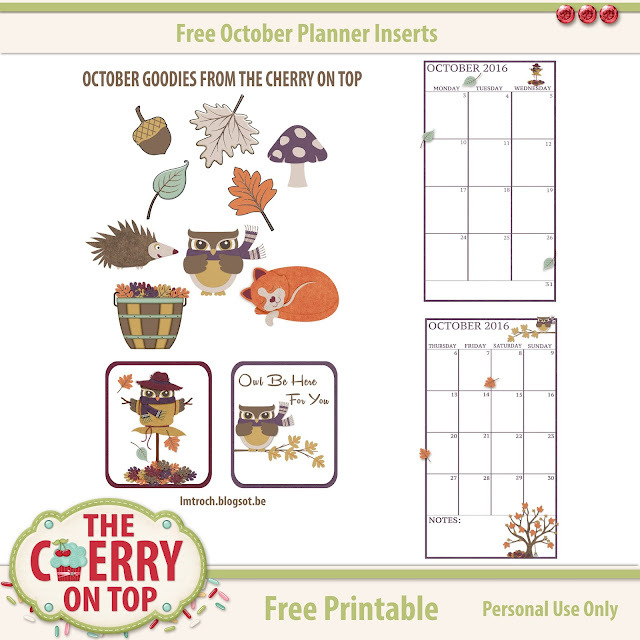 Here are your free October planner inserts and goodies. We've got the entire year so far. Feel free to go back and grab the other month's page of goodies. 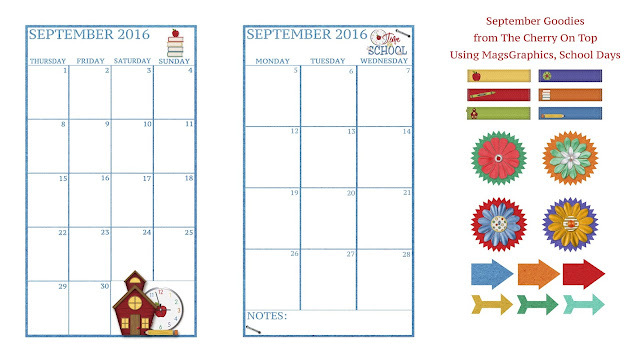 Use them as stickers for in your journals, planners or scrapbook pages. This freebie was really popular. Maybe you missed it? Now, let's take a look at some other fabulous freebies and promotions that other digital designers are having this DSD. I LOVE Aimee Harrison Designs. She always has wonderful freebies on her blog and especially in her newsletter and Facebook. Here's one of my favourite layouts with one of Aimee's kits. If you're digging that cluster, it's free on a previous blog. 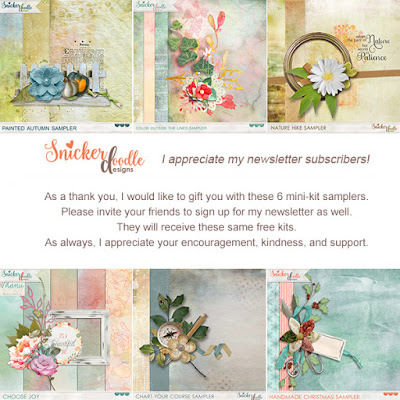 I saw these lovely freebies in Snickerdoodle Deisgns newsletter. You can get them too when you sign up for Karen's newsletter. It's full of wonderful tips, inspiration, tutorials and freebies. This kit from Magsgraphics is 50% off at Scraps-N-Pieces until October 3. The free bits only last 24 hours so make sure you grab them fast and don't miss any more. 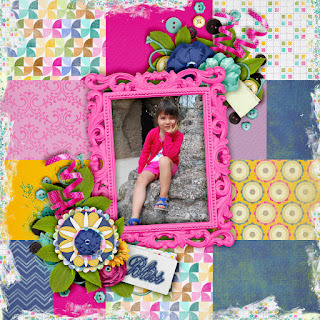 Here's another, lovely freebie from Scrapbookcrazy Creations by Robyn. You can get this at ScrappyBee.com and more freebies on Robyn's Facebook Page. There is a fantastic Commercial Hop at SugarHillco. This is Paty Greif Digital Designers contribution. You're going to love that hop! 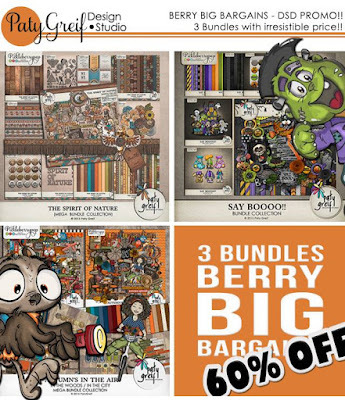 Here's another amazing bundle for a fabulous price from Paty. Leigh Penrod is giving away all kinds of lovely, too. This little treat will be available Friday night. I'll leave you with this last mega freebie hop from The Lilypad. It's already going on so you don't have to wait until tomorrow. We'll see you tomorrow and Sunday with more freebies. Make sure you scroll through our previous blogs and check out all of the free stuff you've missed. Thanks so much for making TheCherry a part of your day. Welcome to hybrid Saturdays with The Cherry On Top. I have two different designers on today's blog. Whoo hoo! 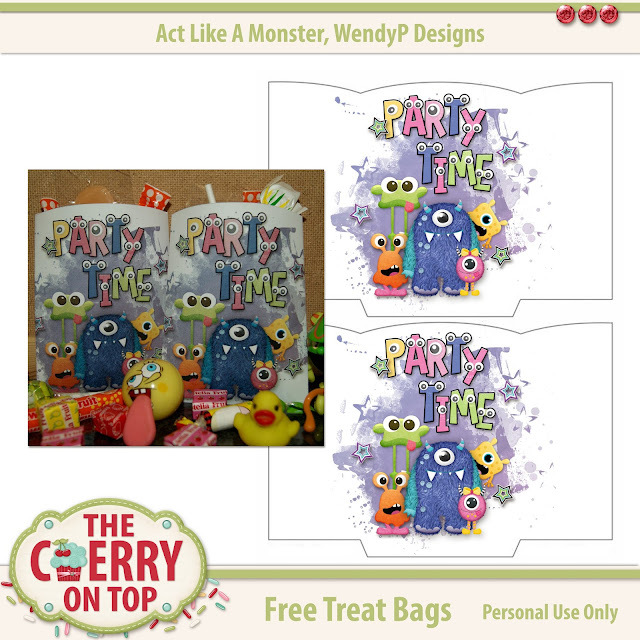 WendyP Designs and Miss Fish Templates. We'll take a look at their newest releases in action and in good ole Cherry fashion, you'll get a freebie for stopping by. Today's freebie is really, really awesome and there are two if you read carefully. Keep reading, get inspired, check out the lovely, new products and get those downloads. I love these shots of me and my oldest son. Sure wish he'd want short hair, again. Hehehe...How about this template? Pretty cool, eh? I love all of the spots to show off these super papers. 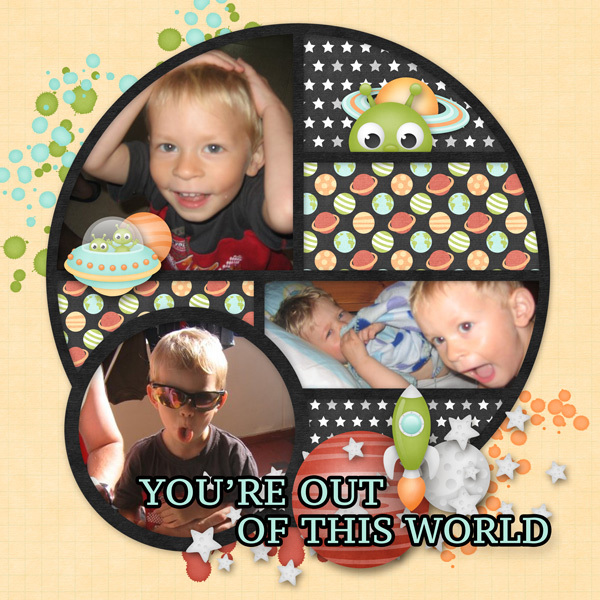 Keep scrolling to see more templates from Miss Fish. This is Wendy's kit. Is it not monsterously magnificent? You know, it was calling me. 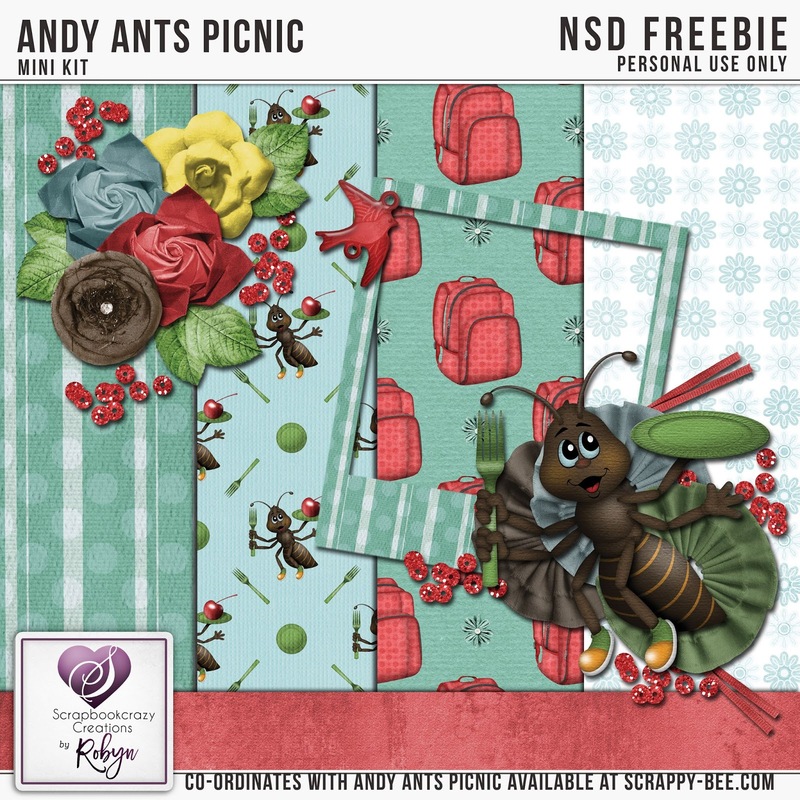 Click on that lovely preview to get to Wendy's store and make this kit a part of your digital stash. I'm thinking you can use these treat bags for Halloween or a party. My boys appreciated them just as they are here, as a treat after school. You don't have to put sweets in them. You could put small treasures that kids love as well. 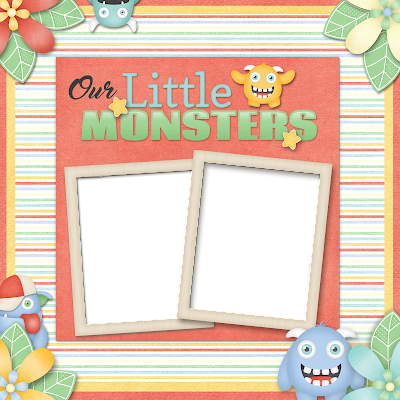 Here's another template using Miss Fish designs. I paired this one up with a free kit from Harper Finch. Head over to Harper's blog and Facebook page and see if you can still get them. If not, she often has freebies. Sign up for her newsletter so you don't miss a beat. 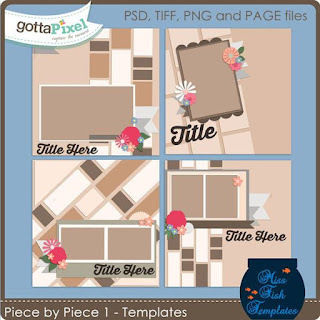 Juli also has a free template in her store at Gotta Pixel. Make sure you visit and get the download. Finally, here is your awesome, free treat bags. They are a snap to get together. Download, print, cut, fold and adhere. You can use double sided tape or just regular, clear tape. Even washi might be cool, just make sure it's rigid enough to hold your goodies. Fold up the bottom flap and adhere. All you have to do is fill it with your goodies. You could easily print out several of these and have them ready in a few short minutes. That's what we are all about here at The Cherry. Inexpensive, easy and fast is what we bring to you. Enjoy your free printable and remember they are for Personal Use ONLY. This really fun quick page. Thanks so much for hanging with The Cherry. I just love Kim Cameron Designs and she is back in the spot light. 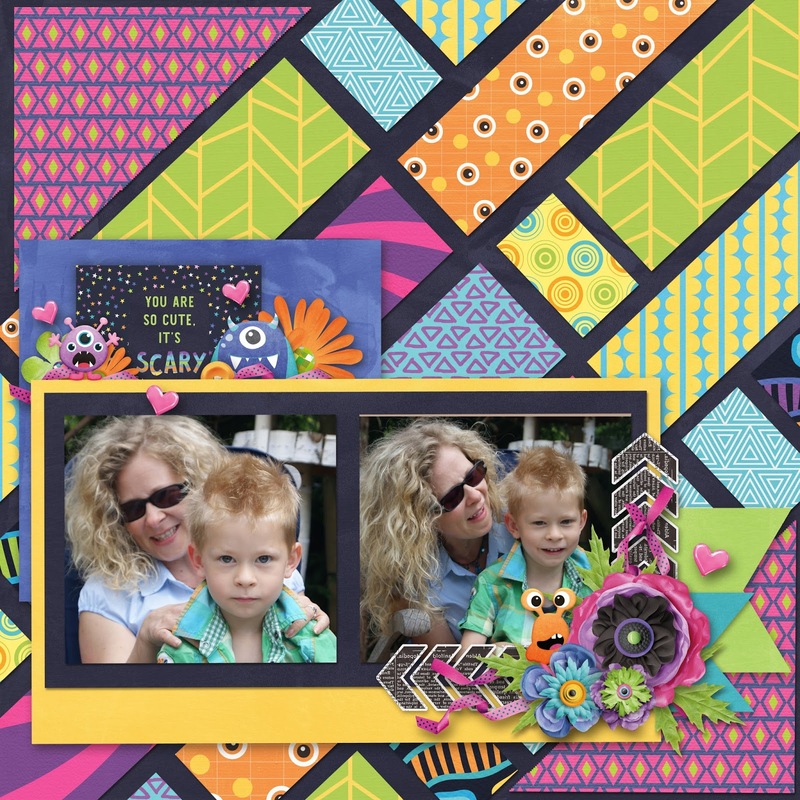 I've got some layout loving, a nifty freebie and a super sale announcement. So keep reading and enjoy! 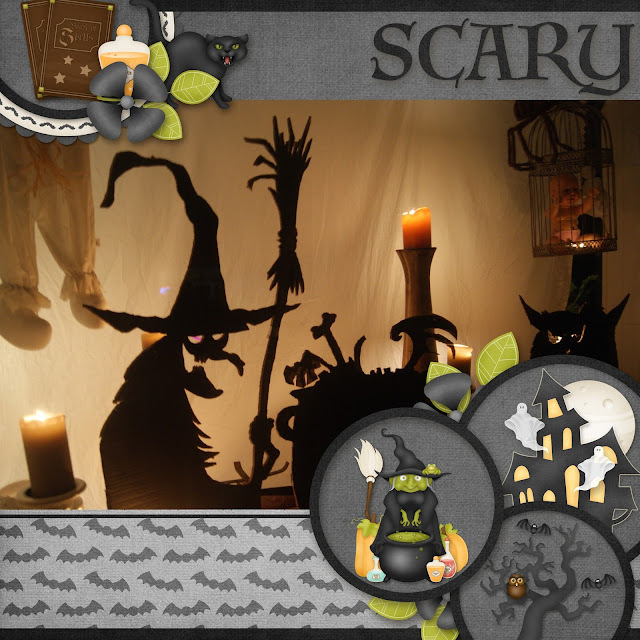 This layout is the inspiration for your freebie, today. I added the tiny cluster to the centre so my layout would be unique and of course, you can do the same with your quick pages. 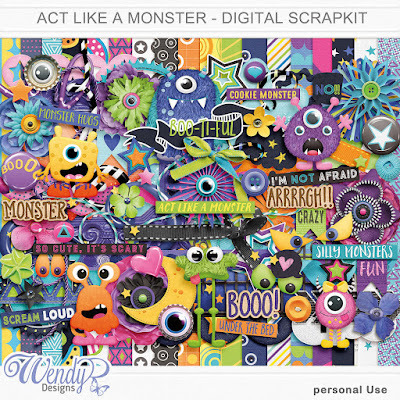 Here are some more monster related kits and goodies from Kim. She is having a mega amazing sale in her shop at Daisies and Dimples. Last time I was shopping there, she had Commercial Use for $1 and other goodies for $1 as well as 40% off. 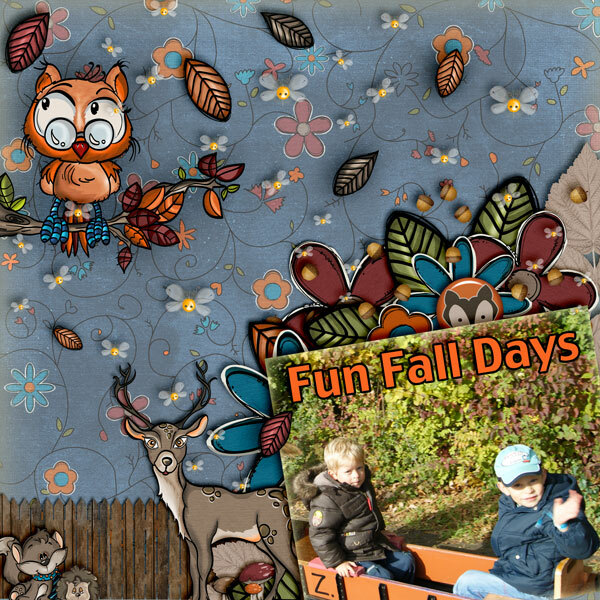 Here is your free quick page. It's Personal Use ONLY. This word art freebie. So cute! 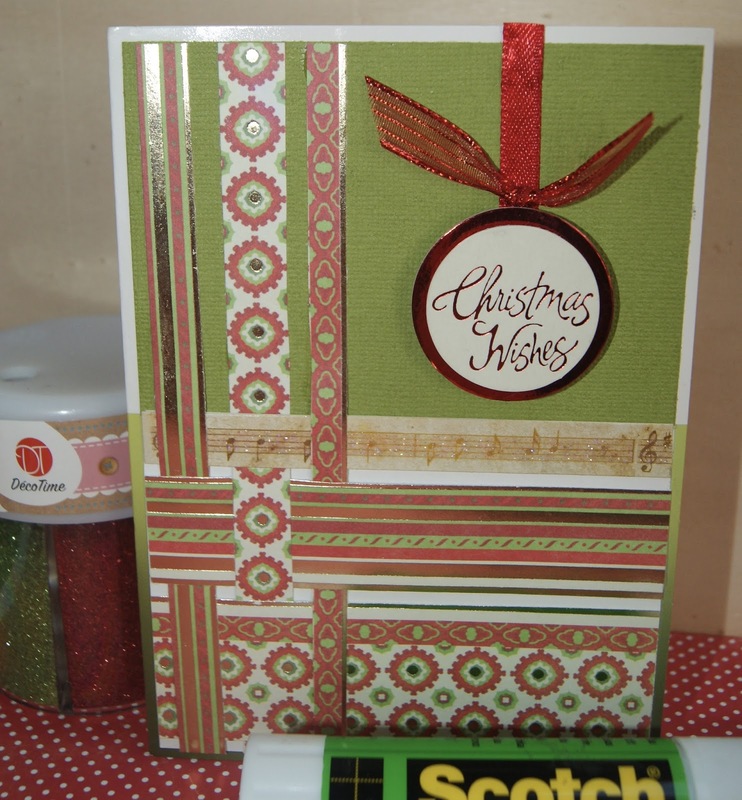 An up cycled Christmas card. And these absolutely fabulous candy bags are coming tomorrow! Eek! It would be so awesome if you followed us here, on Pinterest and Facebook.